Following hot on the heels of the Lamusa II single, Gravity Graffiti keep up their mission into imagined exotic terrain apace with this transmission from Riccardo Schiro. The Italian producer has previously been aligned with the Mystic Jungle Tribe posse, so you know that his credentials in creating rich, synthesiser led music are to be trusted. 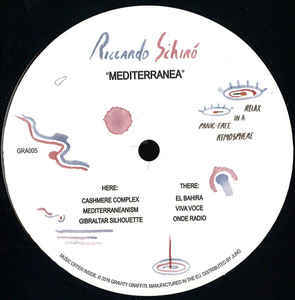 There's an aquatic delicacy about Mediterranea, not least on lead track "Cashmere Complex", while you can also find some shimmering island boogie on "Mediterraneanism". Forget Balearic - this record is sailing out to an unknown sun-baked archipelago somewhere between the Aeolian islands and the infinite reaches of outer space.